Sketch B. Shewing the progress of Section No. 2. 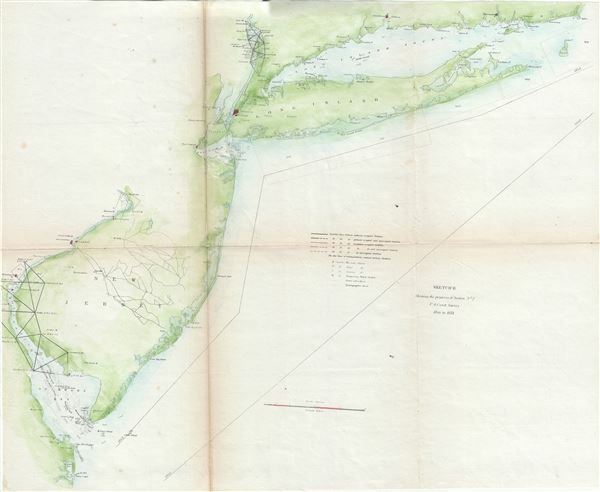 This is an unusual triangulation chart of the New York and New Jersey coast line from the scarce 1851 edition of the Superintendent's Report. It covers from the Delaware Bay north to New York City then east along Long Island as far as Block Island. Shows various triangulation points and some of the attached river systems. New York City, Philadelphia, Wilmington, Trenton, Newark, Elizabethtown, and New Haven are noted. The 1851 edition of the Superintendent's Report is highly unusual in that its maps do not have borders, common to all subsequent editions. Report of the Superintendent of the United States Coast Survey, (Washington) 1851. Very good. Some wear and toning along original fold lines. Minor loss over Raritan Bay. Professionally flattened and backed with archival tissue.